It was not a very happy beginning to Hanukkah for the Jews of San Francisco's Chabad and those who celebrate with them. 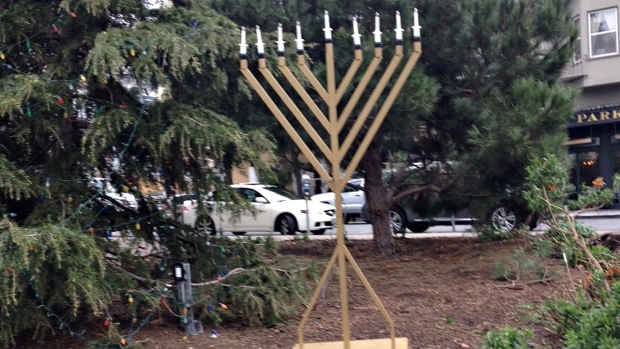 A 6-foot-tall brass menorah was reported stolen from Washington Square Park on Christmas Day, which also was the first day of the Jewish festival of lights this year. The menorah was the property of the North Beach Chabad, run by Rabbi Peretz Mochkin and his wife, Miryum. Chabad is a worldwide Orthodox Jewish organization in the Hasidic tradition. The Mochkins are calling the theft a hate crime, although police think whoever took it might just want to sell the brass pieces for cash. There were no visible signs of anti-Semitism at the site of the theft. In fact, someone had also cut the power cord of lights on the Christmas tree at the same park. "It was devastating," said Miryum Mochkin, who was notified by friends that the menorah was missing. "I was like, 'You know what, the park's big, and you just didn’t see it.' I couldn’t believe it at first." Police Sgt. Michael Andraychak said the thief hauled the 100-pound menorah off sometime in the past several days. He also asked metal recyclers to be on the lookout for anyone trying to sell large pieces of brass. Despite the theft, neighbors of multiple faiths came together in the park Monday night to light their own menorahs, rededicating the space as "a safe place where everyone can practice their religion freely and enjoy the holidays with light." Dozens of people brought their own menorahs and lit them on a picnic table covered in foil to catch the wax drippings. They sang Hanukkah songs and lit up the dark night sky. "For somebody to take a symbol that means light and joy, they must be in a dark space in their life," Mochkin said. A Chabad in Southern California was also targeted this Hanukkah season. In Santa Monica, the Living Torah Center Chabad was vandalized with smeared feces on the window over the weekend. It was not immediately clear what the reason was. No anti-Semitic message was left there. "It's an awful thing, I don't know what's behind it," said Chabad of San Francisco Rabbi Yosef Langer, who is famous for lighting a gigantic menorah in Union Square every year during the holiday. His event will continue every day of Hanukkah at 4:30 p.m. It is his daughter's Chabad that suffered the stolen menorah. The Mochkins still held their Hanukkah event at the site of the theft, and asked anyone who wants to join to bring a small menorah of their own. They said that they won't let the light of the holiday be quashed by menorah thieves. "In the face of this evil and whoever is trying to take this light away, we need to add light," Miryum Mochkin said. Bill Pruzan of San Francisco agreed. "It’s necessary that we be able to have celebrations that are based on being free from this vitriol and hatred," he said. Anyone with information about the theft should call police on the anonymous tip line at 415-575-4444 or text a tip to TIP411 and begin the message with SFPD.